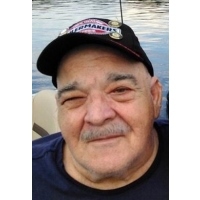 James “Jim” Joseph Rizzuto Sr., entered eternal rest peacefully on Sunday, February 10, 2019 at the age of 76. Jim is survived by his parents, William and Joanna McDonnell; his sister, Annabelle Hamman McDonnell (Roger); brother, Bill McDonnell Jr. (Gail); his 1st wife Geraldine Haas Rizzuto; his children, Lisa Normand (Brent) and Geri Bowen (Randy); Jim’s companion of 10 years, Deborah Held; her daughter, Rebecca Held Highnote (John); and their son Dorian. Jim was lucky to have all grandsons: Brent II (his Lil big guy), Daniel, Matthew and Dorian. He leaves behind many cousins, nieces and nephews. He was preceded in death by his father, Nickolas Rizzuto; his son, James J. Rizzuto, Jr.; his brother, Patrick R. McDonnell (Linda); and his grandmother, Leonardo Venezia Bruno. Jim will be greatly missed by many. Jim graduated from Redemptorist High School and joined the U.S. Navy. He was very athletic as a young man and enjoyed track, football and boxing. He worked hard his entire life. Jim worked as a proud Boilermaker Local 13 Philadelphia and Local 37 New Orleans at Avondale. He dreamed of traveling the country by RV and discovering new places. We would like to thank the nurses (ICU, 2nd and 3rd floor), Dr. Sarah Lillis and all the staff members at Ochsner Slidell for taking such good care of Jim on and off for the past 10 months.